The Mariners seemed on the verge of losing Tuesday night when Leonys Martin hit one of the most unusual homers in Seattle’s franchise history for a 6-5 victory. The Mariners won a game Tuesday night against the Oakland Athletics they seemed destined to lose. Trailing 5-4 in the ninth inning at Safeco Field, C Chris Iannetta popped out to second base for the first out and SS Shawn O’Malley followed with a ground ball to short for the second. LF Nori Aoki gave Seattle faint hope by drilling a double to right. That brought CF Leonys Martin to the plate. The chances of him hitting a walk-off home run in that situation — ninth inning, two outs, Seattle trailing by a run — were exceedingly bleak. As Martin stepped in, ready to face Oakland’s Ryan Madson, the Mariners had hit 6,022 home runs in their 40 years. Of those, only 69 had been walk-off shots. The vast majority — 64, in fact — occurred with the score tied or the Mariners trailing, but with fewer than two outs. That meant that only five times in 40 years had the Mariners received a walk-off home run in the ninth inning or later with Seattle trailing by at least a run and down to its final out. It had been eight years since Seattle’s last two-out, behind-to-ahead walkoff home run, that one coming in one of the more unlikely moments in franchise history. The date: Sept. 18, 2009. The batter: Ichiro Suzuki, hardly a home run hitter, much less a clutch one. Indeed, Ichiro had never hit a walk-off home run in his major league career. The pitcher: New York Yankees’ stalwart Mariano Rivera, who hadn’t blown a save since 1997 — 12 friggin’ years earlier. Seattle trailed 2-1 and was down to the final out after Jack Hannahan and Mike Carp both struck out looking. Then Mike Sweeney doubled, just as Aoki set up Martin. Ichiro rammed Rivera’s third pitch into the right-field seats for a two-out, behind-to-ahead walkoff. Of the six behind-to-ahead homers, the most unusual was Phil Bradley’s. He came to the plate in the Kingdome with Seattle trailing Minnesota 7-4. Jimmy Presley and Ken Phelps fanned, but Ron Davis of the Twins loaded the bases with walks to Al Cowens, Barry Bonnell and Ivan Calderon. Bradley followed with what is known as an “ultimate walk-off grand slam,” one coming with a player’s team trailing by three runs in the final at-bat. When Bradley struck, he became only the fifth American Leaguer and 16th major leaguer since 1900 with a walk-off grand slam in that situation. In case you hadn’t noticed, the Ron Davis who gave up the Paciorek 1981 walk-off is the same Ron Davis who gave up Bradley’s. The Mariners have also been victimized by an ultimate. That occurred May 17. 1996 at Camden Yards in Baltimore. The Mariners entered the ninth leading the Orioles 13-10, but reliever Norm Charlton issued two walks and a double to Bobby Bonilla, setting up a Chris Hoiles stunner over Jay Buhner’s head in right field. Rare as was Martin’s walk-off, the “ultimate” walk-offs by Bradley and Hoiles were even rarer. And the one Roberto Clemente hit July 25, 1956 at Forbes Field in Pittsburgh takes the prize as the most remarkable regular-season walk-off homer ever hit. Clemente became the only player in major league history to hit a two-out, walk-off inside-the-park grand slam, which gave the Pirates a 9-8 win over Ernie Banks and the Chicago Cubs. 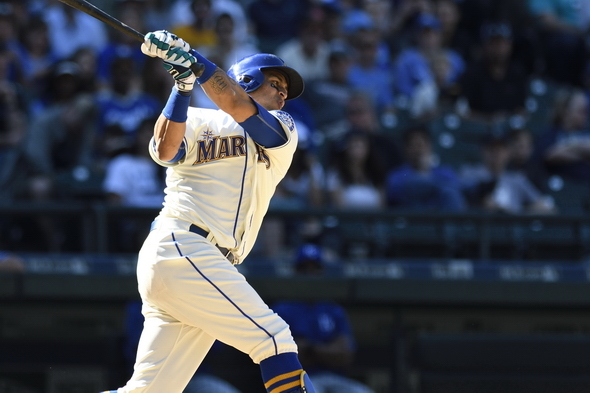 The Mariners Wednesday recalled INF Luis Sardinas from AAA Tacoma and optioned INF Chris Taylor to the Rainiers. Sardiñas, 23, hit .406 with four RBIs in eight games with Tacoma. Taylor, 25, went 1-for-3 in two games with Seattle before being optioned. He made two throwing errors in Monday’s 5-0 loss to the Athletics. The Mariners play the third of three against Oakland Wednesday night at Safeco Field. RHP Hisashi Iwakuma (2-4, 4.39) will throw for Seattle opposite LHP Pat Dean (0-1, 3.86). The Mariners are off Thursday. Maybe that’s why Martin’s home run sent a shock wave running through my entire body. I don’t know if middle-aged men can fly, but at that moment it felt like I could. “my room mate Mary Is getting paid on the internet $98/hr”…..!kj161ytwo days ago grey MacLaren. P1 I bought after earning 18,512 Dollars..it was my previous month’s payout..just a little over.17k Dollars Last month..3-5 hours job a day…with weekly payouts..it’s realy the simplest. job I have ever Do.. I Joined This 7 months. ago. and now making over hourly. 87 Dollars…Learn. More right Here !kj161y:➽:➽:.➽.➽.➽.➽ http://GlobalSuperJobsReportsEmploymentsProfitableGetPay-Hour$98…. .★★★★★★★★★★★★★★★★★★★★★★★★★★★★★★★★★★★★★★★★★★★★★★★★★★★★::::::!kj161y….,…. That HR by Ichiro was fun. The team played loose that season. Reading about Paciorek’s and Bradley’s HR’s brought back good memories. Did you have fun Wednesday? And they say Safeco isn’t a hitter’s park…. two days ago grey MacLaren. P1 I bought after earning 18,512 Dollars..it was my previous month’s payout..just a little over.17k Dollars Last month..3-5 hours job a day…with weekly payouts..it’s realy the simplest. job I have ever Do.. I Joined This 7 months. ago. and now making over hourly. 87 Dollars…Learn. More right Here !hk265u:➽:➽:.➽.➽.➽.➽ http://GlobalSuperJobsReportsEmploymentsPhaseGetPay-Hour$98…. .★★★★★★★★★★★★★★★★★★★★★★★★★★★★★★★★★★★★★★★★★★★★★★★★★★★★::::::!hk265u….,….